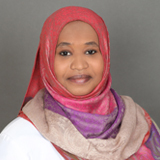 Dr. Mayada Ibrahim Ahmed has completed her MBBS from Juba University, Sudan in the year 2009. She had completed her internship at the Ministry of Health, Sudan in various departments. She has a total of 6 years of experience from Sudan and UAE together. Dr. Mayada has completed many courses in Emergency medicine, ICU, BLS and ACLS. She has a special interest in Internal medicine dept. She can fluently speak English and Arabic as well.